And the story goes to be more funnier when he meet his old girl friend (Aikawa) who works as music journalist and apparently he hates DMC music and lyric due the violent lyric and gruesome. Aikawa don't know the fact that Soichi is the leader of the band. No one people know real identity of Sir Krauser, and he always hide his identity in front of people and acts lame and awkward naturally as Soichi. Soichi could described as momma-boy who act like a girl and childish, he plays his own songs in the street, but no one listen and take an attention. His looks like trendy man but has stupid hair-style. Until he get an opportunity to be a vocalist in a band that would change his career. A Death Metal band named Detroit Metal City, and then the band apparently get more attention and make more competition with another music scenes until facing on the death metal king from America. There are another characters on the movie could be told actually, the plot shows about Soichi chasing his dream with two sides and attracting his old friend. And the climax would end like this? Would Soichi get his real dream as indie-musician and success to get a girlfriend that hates his alter ego? 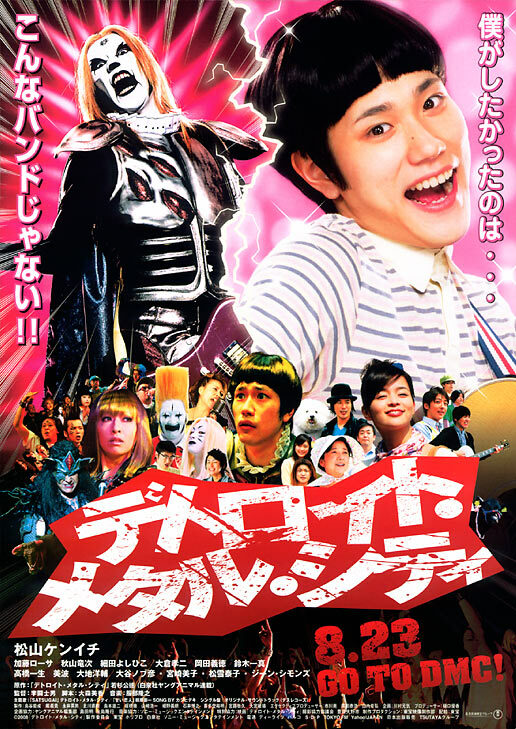 This is not serious movie, its a comedy with Japanese unique characteristic storyline inside, the way to show funny sides are comical because this is live-action from the manga. The main character is main attention to make me laugh of loud, his lame style and the people around that act overly hilarious. One thing that I like from watching Japanese comedy movie, there must be positive messages inside, one of them is "No Music, No Dream"
P.s: Similar like this move is Scott Pilgrim vs. The World, but I prefer this one to be more enjoyable movie about band.